Guest Blogger Today! 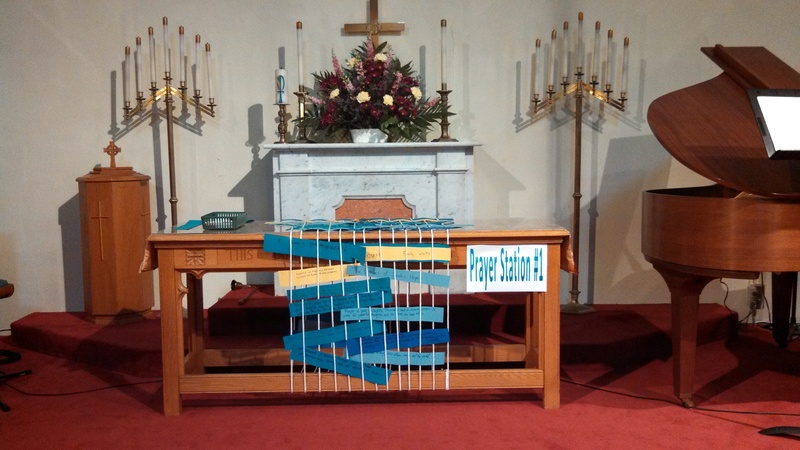 Ashland‘s intern Katie Jasa put together prayer stations for yesterday’s service and did a great job. More on the rest of the service soon. Until then, here are the stations inspired by the Story of Joseph and his family. Our church is woven from all of our lives. Together, our passions and our desires form the material of our community. When we worship, we bring all of ourselves forward to God; our joys, our fears, and our needs. · What has happened this week that you want to celebrate? · What has happened that you want to mourn? · What worries do you carry in your life? Write a joy or concern to share with the church, and weave it into the communion table loom. Share what you write with someone around you; commit to pray for them this week. This prayer station was inspired by this blog (http://theresaecho.com/2012/09/20/interactive-way-to-pray-in-worship-part-ii/). Our station served as a way to have written Prayers of the People. 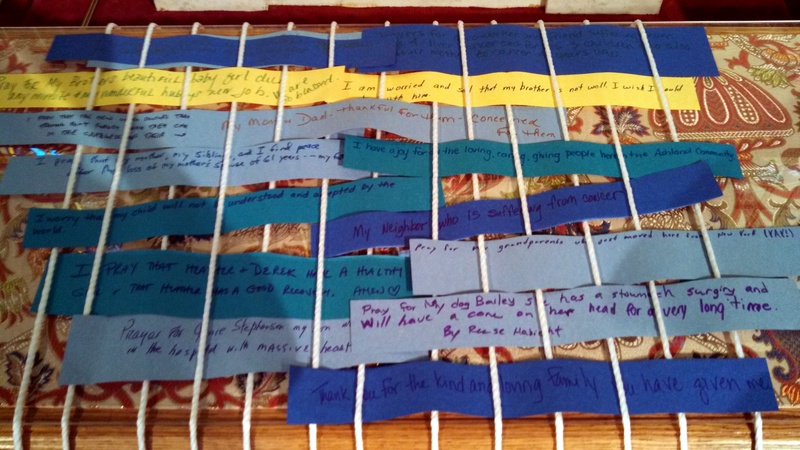 I was surprised how much of the makeshift loom got filled up – there were prayers filling the front and top, and also woven on the back of the communion table. Hunger continues to be a problem in our world today. Bread for the World estimates that there are 925 million people in the world who don’t have enough food to eat, including 29 million Americans. Think of the people who live far away from good food, and the people who can’t afford healthy food. Look at the pictures taken by Peter Menzel of one week’s worth of groceries for families around the world also take time to read the scriptures throughout the sanctuary. · What does it mean to have enough food? · What does it look like to be hungry? · What does God call us to do about hunger? Look at the list of products that Sarah’s Hope gives out to their clients. Choose an item to bring next week, and write a reminder for yourself. This prayer station included pictures from Peter Menzel and Faith D’Alusio’s book Hungry Planet, which is absolutely fantastic. Hungry Planet has a large variety of photos, so I tried to include families of different sizes and incomes from around the world. The pictures were interspersed with scriptures about hunger and food, both from the Joseph story and elsewhere. Our church has an ongoing mission relationship with Sarah’s Hope, which provides temporary housing for homeless women and children. Having each person read the grocery list for Sarah’s Hope and volunteer to bring food next week helped to bring home the need for food justice in our community. · Who takes care of you? · What are the wonderful things that people have done for you? · Think of all the people you are grateful for, and of all the gifts they have given you. Glue pieces of tissue paper onto the picture of a coat, thanking God for something each time. This idea was on several blogs as a Sunday School craft. 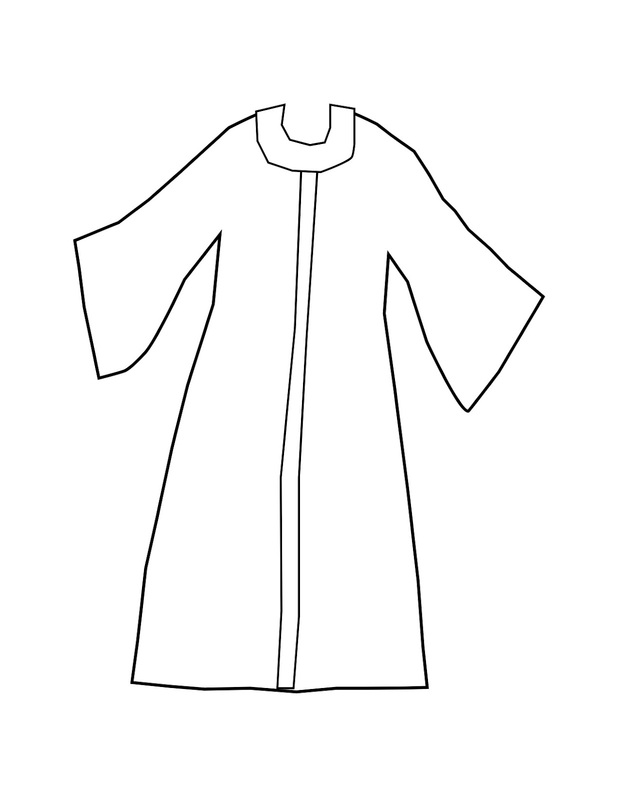 We printed out a coat outline from here (http://2.bp.blogspot.com/-1uo0DTsIL8M/UHDfnIVh1eI/AAAAAAAAAkI/x4MAlPrBTlc/s1600/coat.jpg) and then used the craft as a way to express thankfulness. This station was the only one specifically geared towards children, although we had plenty of children participating in the other stations as well. When Joseph’s brothers were starving, they went to Egypt to get grain for their families. Today we are nourished not only by food, but also by our faith in Jesus Christ. Jesus tells us in John 6:35 that “I am the Bread of Life. Whoever comes to me will never be hungry, and whoever believes in me will never be thirsty.” Touch the grain and think about what sustains you in your life. · What do you need? · Who do you depend on? 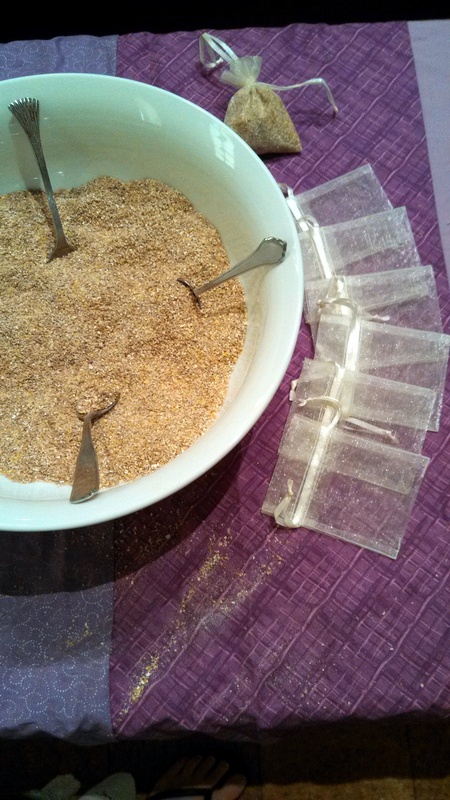 · As you pour the grain into a pouch, reflect on how you are nourished. Take the pouch with you to remind you of Christ’s love. This station began as a general idea from this blog (http://flamecreativekids.blogspot.co.uk/2012/04/hunger-prayer-station.html). I wanted to have a station about what feeds us emotionally, as well as one that focused on physical hunger in the world. Eventually the ideas about physical hunger became station two, and the grain became a tangible way to remember what nourishes us as individuals. We used a whole-grain hot cereal mix from an organic market. Think about the people you are jealous of in your life. · What about them makes you envious? · Is it a way they act, or things that they have? · Write about what makes you jealous. · Where is that jealousy reflected in the way you live? · What fears and desires cause it? · Write where you see envy in your actions. As you look at your reflection in the mirror, consider how God sees you. Think about how God sees the real you and loves you, petty thoughts and all. Let go of your jealousies, and accept that you are enough for God. We wanted this station to focus on jealousy, and to serve as both a confession and a pardon. This post (http://flamecreativekids.blogspot.co.uk/2012/08/reflecting-gods-love.html) had some great ideas about using mirrors to think about God’s love for us, which became part of the stations’ ending. Since this station was one of the most introspective, we put it in a separate classroom. This entry was posted in Ministry, Prayer Stations and tagged famine, grain, hunger, jealousy, joseph, Joseph's coat, prayer stations, prayers of the people, Sarah's Hope, thankfulness. Bookmark the permalink. So sorry to have missed this Sunday’s special reflections at Ashland Church, but so glad to have shared it through this blog. Thanks Katie and Shannon. Great ideas. Will definitely use parts in my teaching.